Chlorurus gibbus (Ruppell 1829), the Heavybeak Parrotfish, aka Steepheaded Parrotfish... a species complex currently comprising C. gibbus in the Red Sea, C. strongylocephalus in the Indian Ocean and C. microrhinos in the west-central Pacific... needs taxonomic review. To twenty eight inches in length. A terminal phase in the Red Sea. Scarus guacamaia Cuvier 1829, the Rainbow Parrotfish. Western Atlantic; Bermuda, Florida to Argentina, northern part of the Gulf of Mexico. To nearly four feet in length. A close up shot of a terminal phase/male to show the intense orange color. Scarus niger Forsskal 1775, the Dusky Parrotfish. Indo-Pacific; Red Sea, eastern African coast to Japan and the GBR out to the Micronesians. To sixteen inches in length. 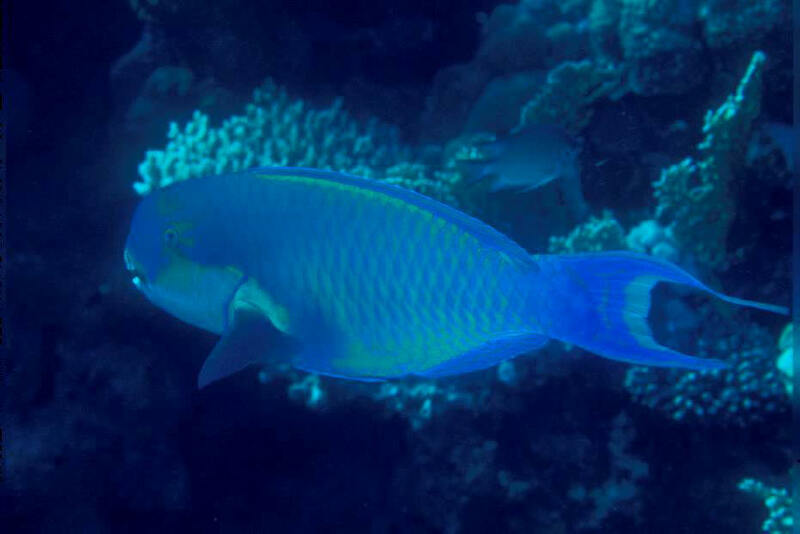 An initial phase/female individual in the Red Sea.